Today, I want to talk about plant based foods for nourished skin. We know winter isn’t leaving us quite yet, and my skin is definitely starting to show signs of lacking good old Vitamin D from sunshine. Besides the daily beauty remedies and rituals that I practice to bring more nourishment and hydration to my skin, I like focusing on nourishing myself from the inside out as well to bring a healthy glow to my face. 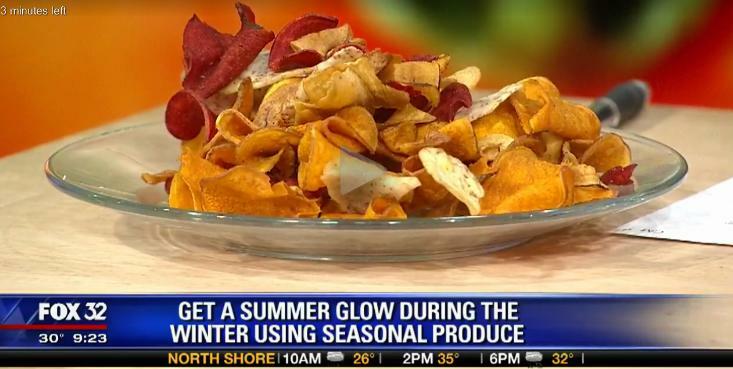 So to show the importance of using food for nourishment, I stopped by Good Day Chicago Fox News a couple weeks back to share 4 plant based foods that have major beauty benefits, and how you can incorporate them into your life! We’re talking root veggies, cauliflower, brussel sprouts and butternut squash! And mind you, these are all seasonal as well. First up in the segment, root vegetables: Root veggies include sweet potato, turnips, parsnips and even carrots! It’s important to buy organic because these come from the soil. So if the soil is toxic it means the veggies will be too. Studies show that root veggies promote heart health and many contain (including sweet potato and carrots) beta carotene when consumed then turns into Vitamin A, and vitamin A is touted as a fabulous beauty vitamin. Even Accutane is a form of Vitamin A, so you know this Vitamin has powerful properties behind it when it comes to healthy skin. As I said in the video, you can swap out potato chips for root chips and make them at home. All you have to do is preheat your oven to 450 degrees, slice your veggies and add your favorite seasonings, cook for around 25 minutes and voila. Crispy healthy chips! Next up, brussels sprouts: Now brussels sprouts are among one of my favorite plant based groups: cruciferous vegetable. There is compound in cruciferous veggies that promote natural detoxing, so it helps move toxins along and out of our bodies. Brussels sprouts also contain Vitamin A, C, flavenoids and fiber, so again a great veggie for digestion and skin health. To make a healthy brussels sprout side dish all you have to do is roast some chopped brussels in a 400 degree oven between 30-45 minutes drizzled again with your favorite seasonings. When it’s time to take them out, drizzle with balsamic vinegar, add some pine nuts and nutritional yeast, and serve! 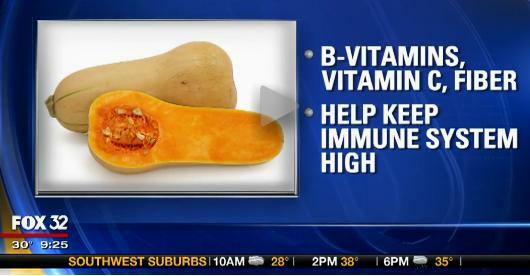 Butternut Squash: Squash is one plant based food for nourished skin that I am absolutely obsessed with! I love squash because it helps support our immune system and again contain glowing skin vitamins: A C and B. I’m tellin’ ya folks make a big bowl of squash, brussels, and root veggies and you’ll be glowing like nobody’s business. To make butternut squash at home, try this simple soup recipe: Take frozen butternut squash cubes, saute them with coconut oil until heated, add about 6 cups of water and two vegetable stock bouillon cubes. Bring the water to a simmer and add seasonings like a bay leaf, rosemary and thyme. Simmer for 20 minutes, then transfer to a food processor and blend in batches. You can top this soup with nutritional yeast or salt and pepper, whatever you’re craving at the moment! Cauliflower: Another cruciferous vegetable that I love. Again cruciferous veggies may help with preventing cancer and promotes strong digestive health. So if you feel a bit heavy after an indulgent weekend, load up on cauliflower and brussels, and you’ll be feeling lighter in no time. Cauliflower is also a wonderful source of protein, riboflavin, niacin, fiber, folate, vitamin B6, vitamin K, thiamin, magnesium, phosphorus, and manganese. In the video I showed one of my favorite cauliflower recipes, gluten free mashed potatoes. If you really love cauliflower and want to experiment with other gluten free recipes, you can also try our cauliflower fried rice recipe! Now that you’ve got a pretty good idea of what type of recipes we can make with plant based foods for nourished skin, it’s time for you to share your’s as well! Feel free to add links to your recipes in the comments below and tell us what type of plant based foods you love for healthy hair skin and nails! Great post! Glad I read it!